Surrounded by exquisitely sculpted feathers, our Design Toscano-exclusive baby angel statue just might turn out to be our most adorable putti sculpture ever. This famous cherub figurine, sculpted before the turn of the century by Italian master sculptor Pietro Ghiloni, is ready to take its place on window ledge or sunny garden wall. 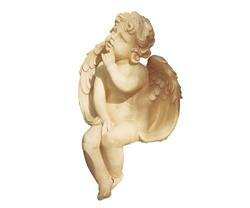 Cast in quality designer resin with an antique stone finish, this darling angel statue features feathered wings, dimpled cheeks and an oh-so-angelic expression.